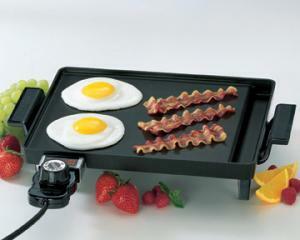 The perfect mini-griddle for singles or couples! With an 8 1/2 x 10 1/2-inch cooking surface, this griddle is ideal for one or two servings. Control Master(r) heat control selects and maintains the desired cooking temperature. Heavy cast aluminum cooking surface is coated with a deluxe nonstick finish for even heating and stick-free cooking. Built-in grease tray catches grease drippings. Griddle is fully immersible with the heat control detached.